Anyway, I entered some more way points into the GPS and I knew this was going to be a long day. The start was again in front of Ostend and we headed towards Nieuwpoort. Typical for a long distance race is that you don't have normal upwind or downwind runs, most of the time you are reaching. Since we normally race buoys, we aren't that good in reaching and reaching with a 16 feet cat isn't just as easy as it is with a 18 feet version. However, we had an exciting race at the end of the fleet with 2 other Hobie Tigers. Because we were sailing close to each other, changing positions, we had the exciting race feeling! All buoys were in place this time so we continued sailing along the Belgian coast. After Nieuwpoort we passed Ostend again and headed for Blankenberge. 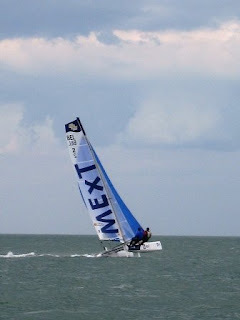 After 2 hours and 40 minutes of racing we took in the spin for the last time and gybed in front of Blankenberge, when... our spreader arm went through the jib. While taking down the jib we had lost a lot of ground on the other boats and we where last in the race, but still wanted to finish it off. Eventually we finished after 86 kms of sailing in a time of 5 hours and 40 minutes. What a day! Not just a regatta but a long distance event. After a short talk to the racing committee they agreed that also F16 boats could participate since we have almost the same handicap as the F18's. Happy we could join, we rigged the boat and set off to the beach. The sea looked fairly flat (but nothing compared to last weeks Swansea bay) and the wind was blowing moderately (say force 4). The start was pretty close to shore with a short upwind leg. We had a good start and came about 7th at the upwind mark. After that we had to find existing buoys of which we had the GPS data. The first buoy was on a reach and soon we had to retrieve the spinnaker since we aren't that comfortable (yet) in double trapping with the kite up. Most of the F18's kept there spin on and a fair part of the fleet overtook us. After 45 minutes of sailing and searching, the committee boat passed by to say the 1st buoy was missing (someone had taken it overnight) but that the race was still on!! No thanks! Tuesday and we got 4 races done today. After yesterday’s 5 races, we managed to get a nice total of 9 races. And all those races had a variety of weather. On Monday we got lots of wind, wavey see and grey weather. Today we got sun, rain, hail, no wind, lots of wind, Southerly winds and Northerly winds. What a day! We scored a 3, 3, 3 and 2. This gets us on 3rd place overall. We are very happy with this result. Especially with the weather we had today, we did good in both heavy and light winds. And we managed to stay upright all trough the 4 races. Even when the hail storm hit us, just after we finished the 3rd race. Today’s racing was very close. In the first race with force 4 (gusts to 5)the three 2-up boats got the lead. Finally Paul and Ann Warren finished first after a day of non-sailing for them. During the other three races the entire field stayed very close together and we swopped places the entire race. During the event the F16 chairman Hans Klok also announced the steadily growth of the F16 class, with members joining from all over the world. Great news, so we’re confident that also the number of competitors during coming regattas will also steadily increase. We will post some more pictures of the 2 regatta days once we’re back home! Day 3 – WE RACED!!!! Yes finally we got out on the water and got our hulls wet. The day started early, first race was scheduled to start at 10.30 and before we were invited to have breakfast at the Mumbles Yacht Club. When we got at the club everyone noticed it was still quite windy, but everybody was dying to get out, so we decided to give it a try. Getting out of the bay was very calm and it took us a while to get to the racing area in the middle of the bay. But once we were out hell struck. What a difference. It was very very windy and shifty, so being concentrated was the key. We managed to get 5 races in today. We however only finished 3 of them. In the 2nd race we flipped the boat during a gybe and Gill’s bungee cord snapped. So we got up and sailed back to shore to replace the bungee. We missed 2 races that way. Final results for us: a 2, a 4 and another 4. So quit happy with this. Too bad we have two 14’s as DNF. Tomorrow we should be able to get another 4 races in and then we can drop 2 of our worst scores, probably these DNF I would guess. Heavy weather and lots of flipping boats in the beginning but no real damage, but the Viper is the worst of. They flipped and broke their diamond spreader. No replacement so unfortunately no more racing for Chris Sproat tomorrow. We wish him all the luck on this week’s Spitfire European Championship. We are happy tired sailors and of to the AGM now. Sunday and too much wind again. Bugger like the English say so well. The only good thing about today was that we almost did not have any rain. We took a bike/walk down to a beautiful bay (Layland Bay) and saw enormous waves. Wind was the same as yesterday (22 knots with gusts to 30) and the waves were a bit bigger because of a changed wind direction. Prediction for tomorrow looks better on Windguru. Although on the pressure charts we see different lows coming close to us again, so we hope the wind will indeed calm down for the next 2 days. I'll try to upload some more pictures of yesterday evening and today. All pictures can be found on picasaweb. Here some little video to show the wind and waves on a piece of inland water (right by the Pier). Gill's parents waiting for the rain to stop. View from the bar on the boats. 4PM - race is canceled for today. First start was scheduled for 12 o'clock, but we were measuring too much wind (over 22 knots steady and gusts of close to 30 knots). We got a postponement to 2PM. At 2PM it was even worse unfortunately. There were 3 windsurfers out (experienced) and they said it was horrible out on the bay. It was like a fan switching on and off they told us. So decision was made that races for today are canceled. I'll post some pictures we made today in the next post. GC - Guys at work! Geert and Hans, having a chat underneath Geert's boat. Gill, sewing the trampoline (little hole in it). We had good wind (10 knots), flat water and sunny weather. 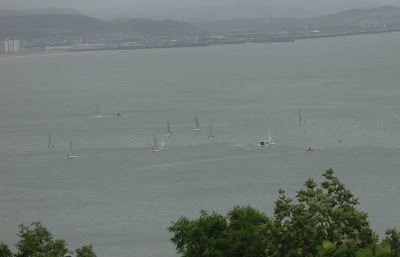 We enjoyed ourselves very much and got to know the Mumbles bay water. We managed 3 races. At first only 3 boats participated. The last race we got 6 boats in. We did very well and were happy with the boat speed. If we could get these conditions for the next days it would be a fantastic sailing event. GC 2008 - Kick off! So this is our first day of racing, practice race. Wind prediction is 10 knots, good for both the one-ups and two-ups I guess. We'll keep you updated on the results of this day. Rumours have it that we will have Chris Sproat sailing the Viper as from tomorrow. We haven't seen him yet, but looking forward to his sailing skills! He does very well on the Spitfire, so what will he think about the Viper? Yep we are awake already! And this is the view from our caravan! (At the moment the day looks very promising, but I guess you never know in Wales….). We will go out for a sail today around 11 with Geert and Joanna! From in our caravan I think wind tactics will be very important as from here you can see that windspots move all the time…. Anyway, we are off to sail!